Launching last year to strong reviews and eager buyers, the third-generation Honda Fit has since set a blistering sales pace while continuing to garner praise. Now the playful and practical 2016 Fit is ready to take the baton, carrying forward best-in-class passenger and cargo space, 41 mpg highway fuel-economy rating1 and sporty yet refined dynamics when it goes on sale July 1 at Honda dealerships nationwide. With a starting manufacturer's suggested retail price (MSRP)2 of $15,790 for the Fit LX with 6-speed manual transmission, the 2016 Fit includes an abundance of class-above standard features including roofline spoiler, LED taillights, Bluetooth® connectivity and a rearview camera. All Fits are powered by a responsive direct-injected1.5-liter i-VTEC® engine from the Honda Earth Dreams Technology™ lineup, producing 130 horsepower3 and 114 pound feet of torque4, with an EPA fuel-economy rating of 33/41/36 (city/highway/combined)5 for the LX with Continuously Variable Transmission (CVT). "The new Fit has been a tremendous hit with buyers seeking a fun, practical and stylish transportation solution," said Jeff Conrad, Senior Vice President and General Manager of Honda. "It's a satisfying car for a wide variety of needs and lifestyles." Outstanding versatility is fundamental to the design of the Fit. With class-leading interior space and clever configurability courtesy of its center-mounted fuel tank and ingenious Magic Seat®, the Fit epitomizes functionality with spacious and comfortable seating for five and the ability to accommodate large amounts of cargo, including long and tall items. 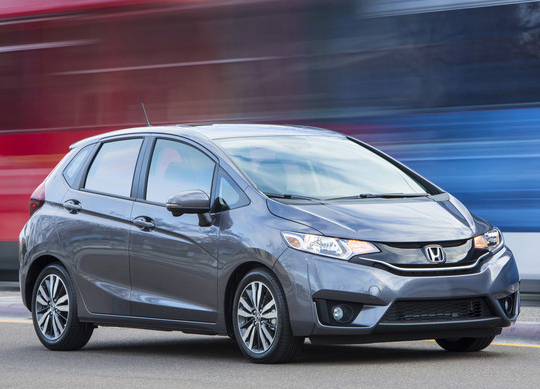 The 2016 Fit offers a sophisticated yet sporty ride, with responsive and stable handling dynamics. Honda's next-generation Advanced Compatibility Engineering™ (ACE™) body structure also benefits handling, as well as safety performance. In fact, the Fit achieves the highest crash-safety ratings in its class for both the U.S. government and the Insurance Institute for Highway Safety (IIHS). An Earth Dreams Technology™ direct-injection 1.5L DOHC i-VTEC 4-cylinder engine powers the Fit. It's tuned for a fine balance of power, torque and response, and is carefully matched with two recently developed transmissions—a slick-shifting 6-speed manual and a CVT with Honda's exclusive G-Shift Control. The 2016 Fit has an EPA fuel-economy rating of 29/37/32 (city/highway/combined)5 for the manual transmission, 33/41/36 for the LX trim with CVT and 32/38/35 for the EX and EX-L trim with CVT. The Fit sports a fresh, dynamic exterior design with headlights that integrate into a solid grille design and an aggressive lower intake. Chiseled sides emphasize the wheels and the dynamically tapered roofline that terminates in a color-matched spoiler. Eight colors, including several vibrant options accentuate the design. Inside, the Fit's interior room and visibility create a sense of airy spaciousness, complemented by soft-touch materials for a quality feel. The available Display Audio touchscreen interface and available leather seating (EX-L models) further communicate a premium feel. A high level of standard and available features are offered in three trims—LX, EX, and EX-L. Standard features on all Fit models include auto on-off headlights, LED brake lights, Bluetooth®6 HandsFreeLink® and a center storage console with armrest. Items such as Smart Entry Push Button Start, a one-touch operated moonroof, 7-inch touchscreen Display Audio7 with next-generation HondaLink and heated leather seats are among the available upgrades. The Fit also features a long list of standard safety features, including Vehicle Stability AssistTM (VSA®) with traction control, side curtain airbags with rollover sensor, Electronic Brake Distribution (EBD), Brake Assist, and Honda's next-generation Advanced Compatibility Engineering™ (ACE™) body structure. The Fit has received the highest available crash-safety ratings from the National Highway Traffic Safety Administration (NHTSA)—a five-star Overall Vehicle Score—and a TOP SAFETY PICK rating from the IIHS. Standard driver-assistive features on all trims include a multi-angle rearview camera with guidelines and an expanded view driver's mirror. The Honda LaneWatch™ system is standard on EX and above trims. Additional information including high-resolution photography of the 2016 Honda Fit is available at hondanews.com/channels/fit. Consumer information is available at automobiles.honda.com/fit. To join the Fit community on Facebook, visit facebook.com/Honda/Fit. 2 MSRP (Manufacturer's Suggested Retail Price) excluding tax, license, registration, $820 destination charge and options. Dealer prices may vary. 6 The Bluetooth® word mark and logos are owned by the Bluetooth SIG, Inc., and any use of such marks by Honda Motor Co., Ltd., is under license. 7The Display Audio Interface is used for direct connection to and streaming from some current [Apple/Android] smartphones. For safety reasons, always launch HondaLink applications or perform any other operation on your phone only when the vehicle is safely parked. State or local laws may limit use of texting feature, and Assist functions may be terminated without notice. Your wireless carrier's rate plans apply. Please see HondaLink terms and conditions for details.